Brighton (United Kingdom) (AFP) - FA Cup holders Arsenal just did enough to keep second-tier Brighton and Hove Albion at bay with a 3-2 fourth-round win at the Amex Stadium on Sunday. Goals from Theo Walcott, Mesut Ozil and Tomas Rosicky saw Arsene Wenger's side into Monday's draw for the last 16, although second-half efforts from the Brighton duo of Chris O'Grady and Sam Baldock helped set up a tense finish on the south coast. Even so, Arsenal never looked in real danger of suffering a a shock to rival either of Saturday's stunning FA Cup upsets, which saw Premier League leaders Chelsea lose 4-2 at home to third-tier Bradford City and Manchester City go down 2-0 to second division Middlesbrough at the Emirates Stadium. Arsene Wenger’s side were mostly on superb form, putting in one of their best displays of the season in terms of attacking movement. They certainly seemed assured after last week’s mood-changing 2-0 league win at Manchester City, and now have an excellent chance of retaining the FA Cup given how the draw has opened up. Should Arsenal actually go and win a 12th FA Cup this season, it would make them the most successful club in the competition’s history, and Wenger the joint most successful manager alongside Aston Villa's George Ramsay, the last of whose six Cup triumphs came in 1920. Arsenal made a blistering start on Sunday, going ahead within two minutes as Walcott hit his first goal in over a year. The quality of finish didn’t look like that of a player out injured for so long, as the England winger angled a drive past David Stockdale from about 12 yards out after Callum Chambers’s run and pass. Walcott wasn’t the only player enjoying a return to the team or the scoresheet. Ozil was making a first start since a knee injury in October and promptly scored his second goal of the season. A glorious passing move -- again driven by Tomas Rosicky -- ended with Ozil checking inside just by the penalty spot and effortlessly taking a defender out of the equation, before sliding the ball past Stockdale. Arsenal were rampant, with Brighton regularly outfoxed by the intelligence and innovation of the visitors' passing. 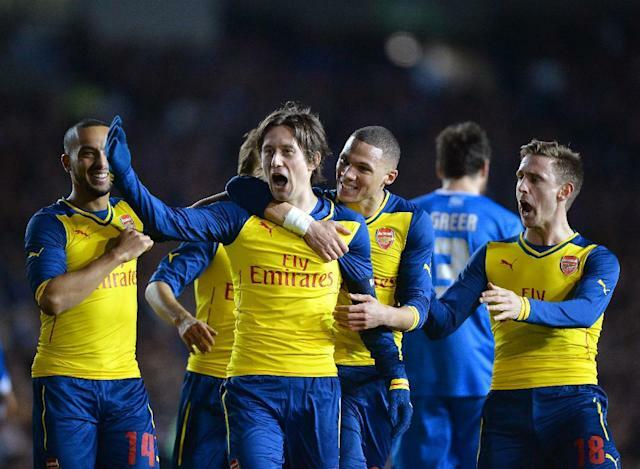 Rosicky was greatly enjoying himself, as evidenced by so many step-overs, dummies and the odd no-look pass. Brighton, however, hauled themselves back into the match after half-time as O’Grady made it 2-1 with a brilliant drive into the bottom corner from just outside the box. For a few minutes, Arsenal looked a little like their old, less-assured, selves as a few balls into the box caused moments of panic. Brighton might also have had a penalty when Inigo Calderon went down under a challenge, but referee Michael Oliver was unmoved. Typically for the day, though, Rosicky took control. Yet another Arsenal surge forward ended with the ball coming out to the Czech on the edge of the box, and he immediately powered a low volley on the hour past Stockdale, who had little chance. The relief could be felt, and a bit more self-expression soon followed. Arsenal were by then back moving the ball around so smoothly, with Brighton having huge trouble pinning down the Gunners' fluent midfield. It threatened to get worse for Brighton as Alexis Sanchez was introduced from the bench after 69 minutes, but actually got better. In the 75th minute, Baldock was released in the box and supremely chipped over Wojciech Szczesny with a finish to match any produced by Arsenal. It said much that Wenger quickly hauled off Ozil for Francis Coquelin, but the Gunners managed to hold on.